Mourikis ... focus on quality. Ideal Standard, a leading European provider of innovative and design-driven bathroom solutions, is strengthening its position in the Middle East and North Africa (Mena) region with the opening of a new design centre in Dubai, UAE, this month. Located on Sheikh Zayed Road, the 1,000-sq-m facility will showcase all its products across two levels. 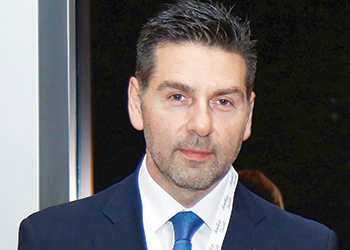 “The purpose of the design centre is to provide our customers, including interior designers and specifiers, a demonstration of all our products and help them understand the benefits of selecting Ideal Standard products,” says Antonis Mourikis, area sales director of Ideal Standard Gulf, which is based in Jebel Ali Free Zone, Dubai. The company will also be launching a number of new products over the next few months. Among them will be Tesi, a collection of bathroom ceramics, furniture and fittings that combine well together to create a versatile and affordable bathroom range. Tesi ... versatile and affordable. Designed by Ideal Standard designer Robin Levien, Tesi is a cross-category solution, with options suited for family bathrooms, cloakrooms and ensuites alike. The collection is slender, elegant and versatile to suit various environment and lifestyle needs, Mourikis says. 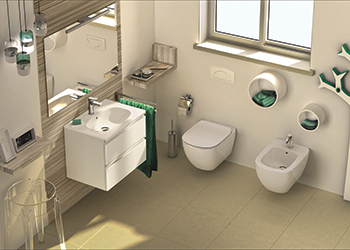 “The toilet bowls within the Tesi collection are fitted with AquaBlade flushing technology, offering high aesthetics with superior hygiene, less splashing and greater noise reduction,” he says. The Tesi range offers different basin choices, including the cloakroom options featuring a simple design to adapt to smaller spaces with ease. One can choose from 60 cm, 55 cm, 50 cm and 45 cm basin options, with a choice of full and semi-pedestals, as well as the 55 cm semi-countertop option for those wanting to combine with marble. A selection of minimal vessels with a very thin modern rim – 100 cm, 80 cm and 60 cm – is also available to combine with Tesi furniture. 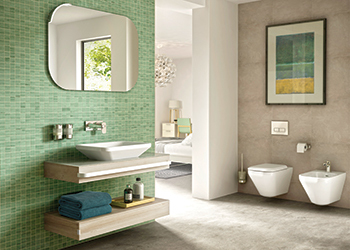 Tesi ceramics integrate seamlessly with the range’s elegant and practical bathroom furniture. The intelligently conceived furniture pieces bring smart discreet storage to busy bathrooms. Tesi mixers are characterised by clean geometric lines and counterbalanced by soft, round forms, and complement the Tesi ceramics. The shower and bath and shower mixers are packed with Click technology, giving the option of using the fittings at 50 per cent capacity, therefore achieving 50 per cent less consumption, Mourikis points out. “Levien has designed many successful ranges, including our most selling Connect range,” he adds. The company is also slowly incorporating AquaBlade technology in all its models. “With AquaBlade, the toilet flushes from the top of the bowl, washing the entire inner surface, and is unique to Ideal Standard products,” he explains. Tonic II ... elegant collection from Ideal Standard. Ideal Standard established a presence in the Mena region three years ago by opening an office in Jebel Ali Free Zone. The aim of the office was to provide its partners and customers with support services and after-sales services. “We can provide spare parts even after 15 years, which is very important for the projects market,” he comments. Over the last three years, the company has witnessed a significant growth in business in this region. “The UAE, particularly Dubai, is a very important market for us as many projects are coming up in the run-up to Expo 2020. Other key countries in this region are Qatar and Saudi Arabia,” says Mourikis. “We offer a wide range of high-quality products suitable for all kinds of projects, including hotels, commercial and residential. We also offer specialised products for hospitals and schools. All our products are doing well in the region as they are all European specified products. We maintain high quality standards and use the best raw materials to manufacture these products. We also own one of the world’s leading brands Armitage Shanks,” he remarks. Ideal Standard’s products have been used at the Burj Al Arab, Akoya and the Dubai International Financial Centre (DIFC) in Dubai, Etihad Towers and Emirates Palace hotel in Abu Dhabi, all in the UAE; Alargan Housing, King Fahad Hospital and King Abdulaziz University Hospital in Saudi Arabia; and Barwa City and The Ritz-Carlton in Qatar. It is also working with Marriott and Hilton hotels in the region.